Wisdom of Life. : Take the extra miles to see the different. I received an unexpected call from one young telemarketing executive representing Citibank. He introduced himself as Daniel. His voice sounded jittery and I knew he must be new on the job. He told me the bank had increased my credit card's limit to another fifty thousand dollars which I could draw out at any time. This is the normal credit card marketing promotion in our country. I did not cut Daniel away from this friendly call. Instead I told him, the fifty thousand was too little for me. I would be more interested if the bank was keen to consider five hundred thousand dollars loan for me. The young Daniel was taken by surprised. Immediately he said, "Sir, no credit card will allow five hundred thousand limit." I continued, "Daniel! How do you know I can't when you have not try to enquire?" With hesitation he said, "It was never done before sir." My turn to speak my mind,"Daniel, if you want to learn something beyond your scope, I suggest you try to enquire from the various departments of your bank. There are many products you have not heard before. You only know and learn, if you are prepared to check and investigate. You have three choices. Either you do nothing for me and you will not learn anything. Or pretend to check for me, when you do nothing again. Or take my sincere advice, when you really take the effort to enquire in details. If you dare to take this challenge, then prepare to take the third option. I believe you will learn tremendously along the way. I am giving you a chance to explore in life young man." My words shocked him for a second. He had never spoken with any client with such aggressive approach. He could only utter with "Ah! Ah! Ah! How can??" With some encouragement I added, "Daniel, I shall give you three days to try. Take my words you will never regret. Ok?" We ended the conversation just like this. Three days later, this time I was caught with another surprise. Daniel called to inform that he had some good news for me. The bank has agreed to grant me few options of the five hundred thousand loan facilities. He really took the trouble to check, recheck and uncheck from various parties concerned. These were the actual words from his mouth, "Sir! You are totally right. There are so many things I had not known. With your persuasion, I had learned so much from my enquiries. You had given me a chance to grow. You are building my confidence and hopes in life. Yes! You are entitled to the five hundred thousand credit limit. Whether you want to apply this loan with me or not isn't important any more.What matter most is! Can you allow me to be your friend?" I was delighted with his confident statement. My little motivation had helped a young man to understand life better. Always think outside the box, be creative in your work and take the extra miles in whatever you do. Later Daniel left me his personal mobile number. He also sent me this message, "Thank you Mr Foo! I felt more energetic after spoken to you. Thank you for your encouragement. God Bless you Sir! Daniel -Citibank." I wished him good luck too. Mark Twain spoken, "Twenty years from now you will be more disappointed by the things you didn't do than by the ones you did. So throw off the bowlines. Sail away from the safe harbour. Catch the trade winds in your sails. Explore dreams." Wow, such a surprise to know that this wholesome experience and lesson had been written down in this blog! Indeed it was a overwhelming and satisfying feeling after knowing that nothing can't be done and extra miles can be achieved if you wanted to. We need to be challenged sometimes though. Thanks a lot for stretching out the potential in me, Robert! May this sharing motivates other to try the unthinkable s. - the Daniel. I am glad I had reached and touched your heart. Reading my blog and at the sametime commenting on it, would also allow you to learn and to understand the content better. Is really a miracle we know by phone or perhaps this could be a fate that i should help you to go the extra miles for the betterment of your future. Your joy is also my happiness. Please stay close and let us know each other more. Thank you for reading my blog. 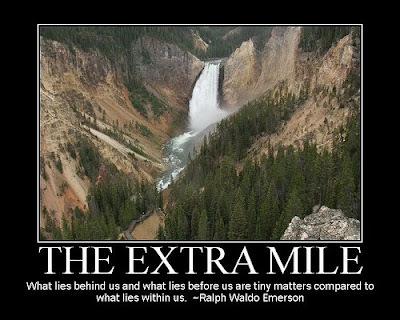 reminded to take the Extra Mile. I got a shock. Mr. Foo, you are the luckiest person that I've seen. You can easily teach people to choose the right path. It might have taken approximately 20 mins and you've changed another person's life. The more I know about you, the more I admire. I believe every one should know their purpose of life on earth or why they are in existence here. The world has given me some knowledge and a little wisdom, I should make use of them to help those who are not so lucky as myself. Happiness is to see others happier and to succeed in life. I am equally happy to have friends like Daniel, Young Kat and Ihsan, who make my life so purposeful.Thanks for the loving comments.